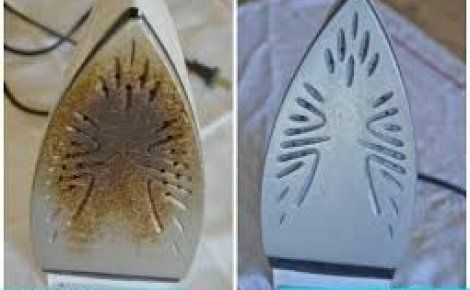 How to Clean Your Iron :: My Cleaners London - Only professional cleaning! Cleaning your iron on a regular basis is essential to maintaining clean, crisp clothes. At first glance, you may wonder how it is that one goes about cleaning an iron. In fact, you may even avoid the task simply because you don't know how to go about it. Fortunately, cleaning the iron is no more difficult than cleaning most other small appliances. All it takes is a little bit of time and a few simple tools. The reservoir of your iron needs cleaning if it looks as though small deposits are being left in the small holes on the soleplate. Typically, the deposits are minerals from the water that you are using in the reservoir. The deposits may have a white color, and they may resemble salt. Cleaning the reservoir requires the use of white vinegar and a clean rag. Fill the reservoir of a cold iron at least one fourth of the way with white vinegar. Turn the iron on and place it on the steam setting. Steam iron the clean rag until the reservoir is completely empty. If the deposits are still visible to you, you will need to fill the reservoir with clean water and steam iron a rag again. If the deposits are still visible to you after this, you will need to repeat the process with vinegar until the deposits are no longer apparent. Rinse the reservoir thoroughly with clean water by filling it completely and then emptying it completely. In order to avoid mineral buildup and deposits, use only distilled or purified water in the reservoir. If you continue to use tap water, simply remember to clean the reservoir periodically. Vinegar has a strong smell associated with it, especially when it is heated. Ventilate the area where you are working as much as possible, by opening windows, turning on vents or fans, or keeping the door open. Unfortunately, the soleplate of an iron is prone to occasional build up. Therefore, the soleplate requires cleaning in order to avoid staining the clothes or fabrics. Avoid abrasive cleaning powders or scouring pads. Begin with a cold iron that is unplugged from the electrical outlet. Use a mild dish washing soap or laundry detergent to create a sudsy solution. Use a nylon mesh pad, sponge, or a clean cloth dipped in the solution to completely wipe off the soleplate of the iron. Wipe the soleplate clean with a damp cloth or rag. If the soleplate is the victim of a starchy build up or corrosion of some form, you will need to use something a little stronger. Use a clean cloth dipped in white vinegar to remove the build up. Wipe the soleplate clean with a cloth dampened in clean water. If this does not work, then you will need to heat a solution of white vinegar and salt until the salt dissolves. 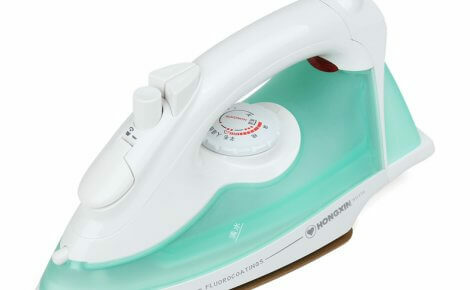 Using a clean cloth sipped in the heated solution, wipe the iron's soleplate clean. Continue wiping until you have removed all of the build up or corrosion. Remember to wipe the iron completely clean with a cloth dampened in clean water.